Kneale Mann | Leadership: Privacy | Real or Imagined? 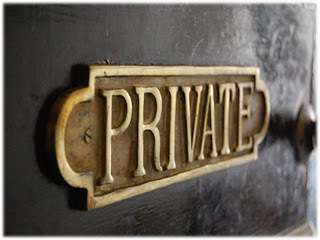 Privacy | Real or Imagined? The quality of being apart from company or observation. If you ever go shopping, enter a bank, drive on a road, walk down a street or sit in a restaurant, you are giving up your privacy. Not only can others observe your actions but you may actually be on camera. We are being photographed and filmed dozens of times every day from almost the moment we leave our home. But most of us don't give it much thought. It is a way of life and since no one will do anything sinister with the information, we seem to be okay with it. Privacy is dead and social media hold the smoking gun. If you are on a social networking site, your information could also be stored on hundreds of other external sites and applications in virtually any language without your knowledge. That means your information could be available to the more than 1.8 billion people around the world who are online. And you should assume that’s the case. One example is Facebook Places. If you don't want that activated, go to account settings, notifications, scroll down to places and un-click the boxes. If you haven't changed your privacy settings in the last few weeks, it is currently activated and Facebook didn't ask if it was okay with you. One way to monitor yourself online is to set up Google Alerts on whatever phrase you want and you will get a daily email with the results. Another is to ensure you register your name domain if you can get it. You don’t have to build a website but you should reserve that piece of real estate before someone else does it. The ability to seclude and reveal selectively. The U.S. Army has one of the most extensive digital engagement policies around and one line says it all – you are always on the record. Know that, understand that, grasp that and you won’t be surprised if your information is shared – with everyone. It is also a good idea to review all of your profiles once a month to ensure nothing weird is going on. And do a vanity search on your name regularly to see what may be out there with your name on it. The state of retirement or free from intrusion. You can triple bolt your front door and never leave the house, but as soon as you step where others hang out – on or offline - you may be watched. I didn't even begin to discuss the latest wave of location based sites which will continue to multiply. Yeah, I have some work to do. So does privacy still exist?